The UN Secretary-General, António Guterres (l), meets Salman bin Abdulaziz Al Saud, King of Saudi Arabia on the occasion of the signing of a peace accord between Eritrea and Ethiopia in Jeddah, Saudi Arabia on 16 September 2018. 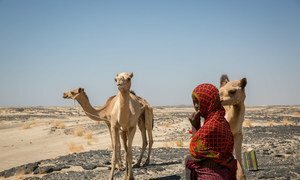 There is a powerful wind of hope blowing across the Horn of Africa region, said UN chief António Guterres on Sunday, in Saudi Arabia to witness the signing of a peace agreement between Ethiopia and Eritrea, ending decades of simmering conflict. “The signature of the peace agreement between the President of Eritrea and the Prime Minister of Ethiopia is indeed a historic event,” said the Secretary-General, speaking at a press conference following the signing in Saudi Arabia's second-largest city, on the Red Sea coast, with Foreign Minister Adel Aljubeir. The UN chief also noted the peace agreement between the President and his former Vice President in South Sudan, that was signed on Thursday – in Ethiopia’s capital Addis Ababa - as another indicator of real diplomatic movement across the Horn of Africa and its borders. 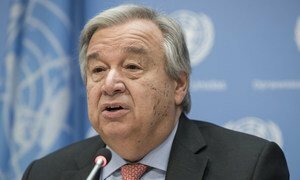 UN Secretary-General António Guterres has welcomed Thursday's meeting in Djibouti with the foreign ministers of Eritrea, Ethiopia and Somalia with the Djiboutian head of diplomacy. United Nations Secretary-General António Guterres has welcomed the high-level visit of a delegation from Eritrea to neighbouring Ethiopia which began on Tuesday, as “a first concrete step” in the process of normalizing relations between the two countries.